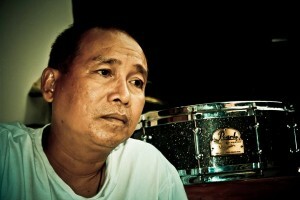 The drummer of the legendary Bali band, “Crazy Horse Band Bali”, Kunyit (I Wayan Suwitra) is no longer with us. Kunyit passed away at the Sanglah Hospital in Denpasar, Bali, on Wednesday (11/11/2015), around 08:00h. His departure shocked the families and friends of the artist. Kunyit was suffering from leukemia over the last few months. Widya Jayanti, the eldest daughter of the late Kunyit, said that in the days before passing away her father asked for “The Police” music to be played on his cell phone. “Dad had asked for songs of The Police to be played while hospitalized. This was unusual, I was surprised, and did not know well what he meant” said Widya. She also said that her father was still making movements of playing the drums while in care. The Crazy Horse Band started playing music in 1986. They are Wayan Kunyit (drums), Gus Joni Suparta (bass), Beny Suharto (singer), Dewa Wijana (guitar), Bardi (keyboard) and Ketut Sana (singer). They are Bali’s legendary band playing a very wide variety of music including Blues, Rock N Roll, Classic Rock, Top 40’s, Reggae, Latin, 60’s & 70’s Standard Music and Indonesian Hits. They play frequently as special events with famous Indonesian musicians but also at Music Festivals and many restaurants and bars. According to his friends, Kunyit was a person easy to get along with anyone. The departure of the 1960-born musician, will be missed by his wife, two daughters, friends but also by the many local and overseas fans of Crazy Horse Band Bali. The cremation ceremony is expected to be on Sunday (15/11) or Monday (16/11). Fantastic band, follow them every year we come to Bali.Sometimes think they are better than the the Real artists they coping.Lead guitarist is absolutely brilliant and very very very talented.Should be playing at concerts! !